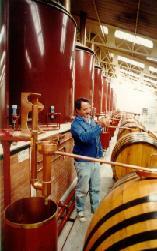 As long as Cognac gets older in boles, you can add to the original Cognac, Cognacs with different vintages and ages. These successive melting give to Cognac, all along years, its fineness and it unforgettable aroma. The complexity of the cognac manufacture is then real. The satisfaction that can be felt when you have succeeded in chosing an optimal flavoured vintage is easily understandable.